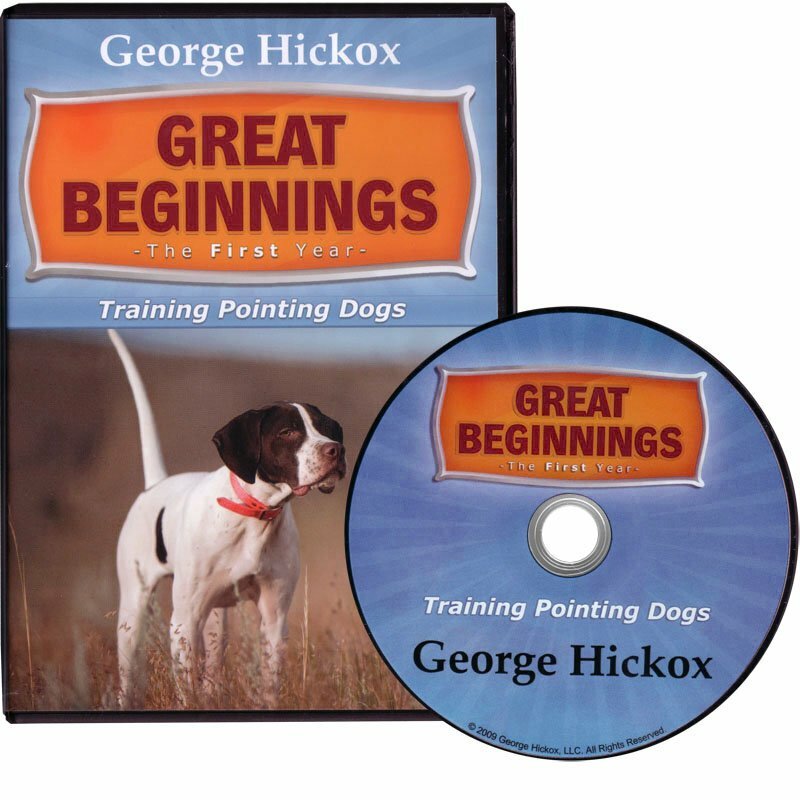 Great Beginnings: The First Year - Training Pointing Dogs DVD with George Hickox. $39.95. "Very informative to get started." Very informative to get started. This is my first go at training a bird dog, and it's coming along well thanks to the video. Very good explanations and age windows. My dog is much more interested in training now. I just wish he would tell where to get pigeons for training. "Can't wait to start training new puppy!!" Shows how to get the first year started. Leads you into the next series of videos from George. You will still need to read between the lines. Can't wait to start training new puppy!! The new approaches to clicker training and e-collar introduction will benefit all owners and their dogs. Great Beginnings follows the development of four English Pointer littermates through the critical first year. George Hickox demonstrates the comprehensive program that has helped thousands of dog owners in his school of "Dog Training for Owners and Their Dogs" across North America. The new approaches to clicker training and e-collar introduction will benefit all owners and their dogs. The first year is the time to lay the proper foundation for more advanced training. Preparing your dog correctly from the beginning is far better than trying to fix problems later. In this DVD Hickox guides you through proven methods of creating a dog who responds enthusiastically to training with an open mind. Great Beginnings presents a complete and logical program of yard work and field work. George is the Hunting Dog Editor for Shooting Sportsman Magazine and a contributing writer for Pointing Dog Journal, Retriever Journal, and Purina's Today's Breeder. George and his dogs have been featured frequently on television and in outdoor publications. George's previous training videos have won numerous awards for instructional excellence.